As odd as it may seem, Kansas once had a national forest. In 1905 President Theodore Roosevelt signed an executive order designating 80,000 acres of land south of the Arkansas River and southwest of Garden City as the Garden City Forest Reserve. 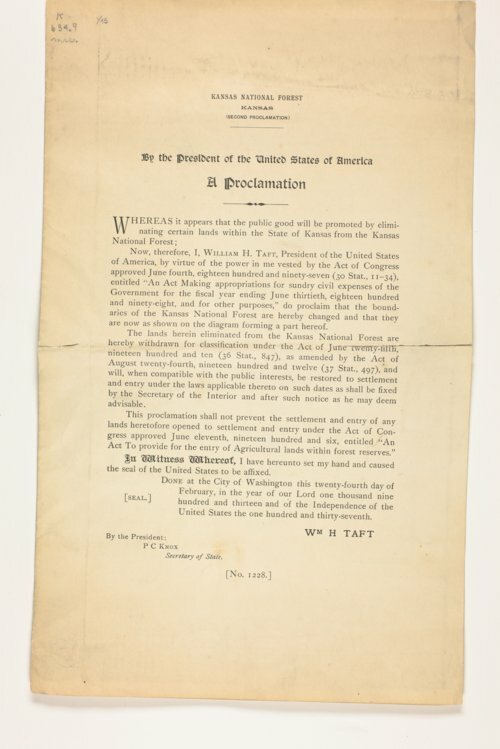 See the proclamation in Kansas Memory. This forest was an experimental effort to determine which species of trees adapted best to the southwest climate. Planting began in 1906 and by April the government had planted 50,000 yellow pines and 30,000 hackberry, locust, and Osage orange trees. In 1907 the forestry service sent 170,000 evergreen, black locust, western yellow pine, jack pine, and Scotch pine trees to the reserve to be planted. The first year was successful, but a prairie fire devastated more than 200 acres in early 1907. In 1908 the forest was expanded to include 302,387 acres and was renamed the Kansas National Forest comprising the counties of Finney, Kearney, Hamilton, Grant, and Haskell. A harsh drought in March 1911 killed 90 percent of the living trees. Replanting the forest in evergreens increased the survival rate, but the uncertainty of precipitation, hot summers, and rapid moisture evaporation spelled doom for the forest. Plantings continued in 1911 with cottonwood, jack and yellow pine, locust, catalpa, hedge, white willow, and white ash. Approximately 200,000 conifers were scheduled to be planted in 1912. Ten years after its birth, President Woodrow Wilson abolished the forest in October 1915. By December 1915 the more than 300,000 acres of land in what had been the national forest was added to federal land that was available to homesteaders. The strongest survivors of all the trees were a stand of yellow pine, planted in 1906, which never grew more than two feet tall.